The Singapore property market in coming years will be challenged by moderately growing economy, coupled with imbalances in demand and supply across various sectors. These factors will continue to add the pressure on occupancy and rents. Demand for new residential properties perked up in 2016, with sales rising by 7% to more than 7,900 units from about 7,400 units in 2015. New housing projects in Singapore such as the Clement Canopy and Grandeur Park Residence witnessed healthy sales on their very first weekend of launch. The outlook of an improving property market of Singapore, affordable loans and relatively more inexpensive small apartments have attracted many investors back to real estate. Goldstein Research analyst forecast the Singapore property market to grow at a CAGR of 7.3% during the forecast period 2016-2024. Further, the Singapore property market accounted for the USD 70.4 billion in 2016 which is likely to reach USD 124.6 Billion by the end of 2024 attributed to the growing foreign investment in the country in across various industries. 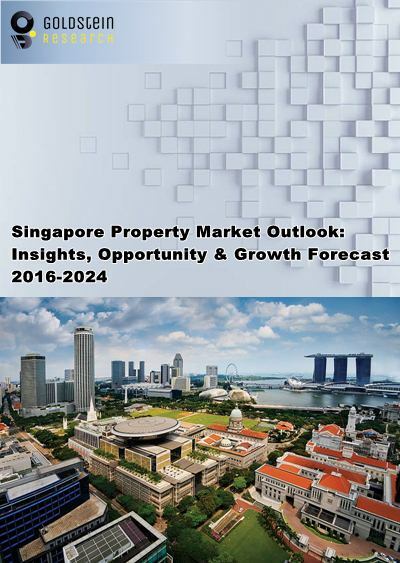 The report covers the present ground scenario and the future growth prospects of the Singapore property market for 2016-2024 along with the total revenue of real estate sector in every region. We calculated the market size and revenue share on the basis of revenue generated per segment and region on country level. The revenue forecast is given on the basis of number of real estate developers and current growth rate of the market. Based on property type, residential apartments segment accounted for the largest market share of more than 68% in 2016, but average property prices in SINGAPORE have dropped by 0.8% in the same year. On the other hand, residential apartments are likely to dominate the market in coming year with more than 8,000 residential building commencements in the country. Singapore Property Market Outlook 2016-2024, has been prepared based on an in-depth market analysis from industry experts. The report covers the competitive landscape and current position of major players in the Singapore property market. The report also includes porter’s five force model, SWOT analysis, company profiling, business strategies of market players and their business models. Singapore property market report also recognizes value chain analysis to understand the cost differentiation to provide competitive advantage to the existing and new entry players. Our UAE property market report comprises of the following companies as the key players in the India property market: City Developments Limited, EL Development Pte Ltd, Far East Organization, Frasers Centrepoint Limited, GuocoLand (Singapore) Pte Ltd, Kingsford Development Pte Ltd, MCC Land (Singapore) Pte Ltd, Qingjian Realty (South Pacific) Group Pte Ltd, Sim Lian Group Limited, Tuan Sing Holdings Limited, ACT Holdings Pte Ltd, Allgreen Properties Limited, Ascendas Pte Ltd, BBR Holdings (S) Ltd, Bonvest Holdings Limited, CapitaLand Limited, Bukit Sembawang Estates Limited and United Industrial Corporation Limited. According to our Singapore property market study on the basis of extensive primary and secondary research, one major trend in the market is declining number of foreigners in job which has significantly decreased the property rent costs. According to Manpower Ministry of Singapore, the number of foreign workers fell by an estimated 2,500 in 2016. There were about 1.15 million foreign workers in, excluding maids, in Singapore in 2016. Declining foreign workforce in Singapore is significantly resulting in decking prices of residential rentals. According to the report, major driver in Singapore property market is lower interest rate for home buyers which have major impact on the growth of property market of Singapore. Moreover, overall prices of home feel slowest in 2016 as compared to 2014 and 2015. The considerable measure by the government such as Total Debt Servicing Ratio (TDSR), has significantly tamed property demand. Further, the report states that one challenge in Singapore property market is the affordability of the property. Even after, declining prices of property in Singapore one cannot easily afford the residential property, which is restraining the potential buyers to buy an apartment or house in the country.